As a former resident of Tampa, and aware of all the crime, reputation, boundary "wars", and perverse reputation for strip clubs and citizen-funded stadiums, this book had me hooting! At best, Tampa is weird with a history of corrupt politics and bizarre planning. At worst, it was a haven for car-jackings, real estate scams, and home invasions. All this was coupled with the pseudo society perched on Bayshore Blvd., which did, indeed flood at the slightest rain. The car dealers are accurately portrayed, as would be the impossible plight of a transplanted mid-westerner. Perfect! But fortunately there is the well-versed Serge, with his own strict and twisted code of honor. It is impossible not to learn a lot of Florida's checkered history when reading one of these books--a truly fascinating aspect to the read. revenge with a whoopie cushion. If you like your humorous revenge psychopathic, this is the story for you. Before there was Dexter, there was Serge, and he isn't fooling anybody. He's your (vastly hyper and annoying) friend for life... unless you're a jerk... then you're dead! In some elaborate and hilarious way. I love the way Dorsey weaves together disparate strands into his typical explosive climaxes. He is a careful plotter and a very clever writer. Love it. Just FYI: My mental image of Serge is a sort of morphing of Mike Myers/Jimmy Fallon/Johnny Depp, but I definitely think Depp should play him in the movies. Oh, yes, for sure. What to listen to a book that will make you laugh out loud? This will do it! Serge, the anti-hero, villain, hero, whatever you want to call him.....and the funny thing, I KNOW people like him! Which character – as performed by George K. Wilson – was your favorite? If you could rename Triggerfish Twist, what would you call it? What a great read, or listen as the case may be! Or, Serge Goes Straight. He talks about it anyway. But his idea of going straight includes a kidnap for ransom to finance going straight. Still, it's not quite as over the top as other Serge Storms books -- he only arranges two of his patented Rube Goldberg killings, and much of the remainder of the book is peopled by very eccentric but mostly ordinary characters, with a relatively low body count. So all in all, a bit on the light side, but still laugh out loud funny. Well, when I say eccentric but mostly ordinary, that doesn't describe Serge's sidekick Coleman, who is anything but ordinary. Although this is Dorsey's third Serge Storms novel, it either predates or is concurrent with the first, Florida Roadkill. Dorsey explained that this was the only way to write about characters who were killed off in earlier books -- he must mostly mean Coleman. You can see why Dorsey would want to resurrect him for Triggerfish -- his character really comes to life, hilariously. So successfully that Coleman somehow comes back from the dead in later books despite (apparently) dying in Roadkill. The most memorable moments of any Serge Storms book is when Serge goes on one of his semi-coherent, super-coherent rants. In Triggerfish, he gives the commencement address at a local Tampa college, even though he is not on the faculty -- which doesn't stop him from holding a popular lecture class on Florida history and culture. His advice to the graduates is priceless. The way George Wilson reads Serge, especially when he riffs on this and that, simply cannot be replicated in reading the print version. It requires this kind of performance. And after yay many Serge Storms books, he has it down pat. At this point, I've read two of Tim Dorsey's first five Serge Storms books in print and listened to two others on audio, and audio is hands down the winning format -- the fifth of those first five is cued up in Audible for a listen in the near future. Like TV shows "My Name is Earl" & "Seinfeld"
This is my first Serge Storms book. Although this is the fourth book in a series, I felt that the book could stand alone. The book takes the best parts of the TV shows like "My Name is Earl" and "Seinfeld." In Serge Storms, you have an anti-hero (in this case a sociopath/petty theft) with a cast of zany characters inhabiting a neighborhood in Tampa. Poor decisions are made and unfortunate events occur. These missteps unwittingly become magnified by Serge, his violent, coked-out girlfriend, Sharon, and stoner buddy, Coleman until all chaos breaks out. This is book is hysterical and had me replaying chapters to re-listen to the funniest parts. The author has a wickedly funny perspective on American culture and the city of Tampa, in particular. The narrator effectively uses different inflections and tones to distinguish the characters. I could tell who was speaking from the narration voice. He uses a nasal voice for most characters, especially the law-abiding characters naive to the plots of various rouges. This may detract for some readers, but I found it a communicated the innocence of the characters. The book involves sexual matter and murder. If you are easily offended, you probably should pass on this book. For myself, I will be returning to Tim Dorsey's Tampa again to read the first book. Wow! Don't know who came first, Tim Dorsey or Carl Hiasson, but they are right up the same twisted Florida alley . . . or lane! The most average family in the world moves from the Midwest to Tampa and finds out that it is a different planet (maybe in a different galaxy) inhabited by the wackiest cast of characters you could imagine. For the first half of the book, while the characters are being introduced, I wasn't sure if I was listening to a novel or a set of short stories. It eventually becomes clear that the characters are all on a collision course with one another, through a series of comedic events that could be almost believable individually but combine in a crazy, surreal whirlwind to take your breath away. There were a couple of times I wished I was holding a book in my hands instead of listening, so that I could go back and refresh my memory or easily re-read something. The narration was terrific; when the narrator wasn't in "character" he made it sound like a documentary which added to the fun. In character as Serge, he reminded me of Ignatowski from Taxi. Laughed out loud several times, and was so impressed with Serge's commencement address that I googled and found it online. Wacky Florida crime stories are one of my favorite genres, but this was my first Tim Dorsey. Will definitely read more! This seemed like a bad joke, but then I am not familiar with this style of book. I expected it to be a mystery by the description, and I honestly don't know what it is. There is absolutely nothing that would have improved the experience. First time in years I've considered ditching a book halfway (actually much sooner) through. 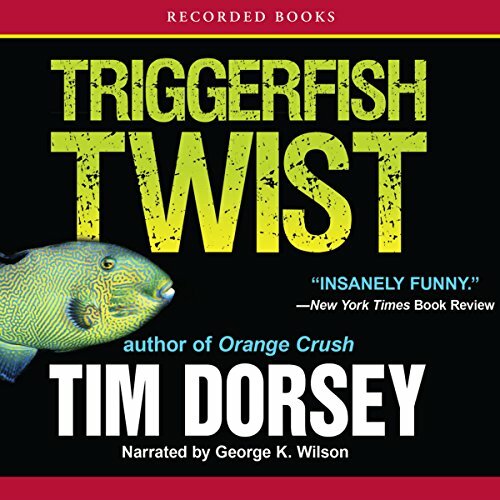 Has Triggerfish Twist turned you off from other books in this genre? It has made me very wary of descriptions, as I do not consider this a serious mystery. It wasn't the narrator's fault--the story is so badly written and so incoherent. Irritation. I feel like I was sold a bad joke. Had I paid full price for the book, I would have probably complained as the description did nothing to warn me. Descriptions should be more accurate, and I wish reviewers would not assume that those considering books have read other work by the same author. Obviously I wouldn't have bought this one if I'd ever had the misfortune of reading another of this type, but I came into it cold and would have liked to know it was nonsensical (and not in a good way). love Tim Dorsey books, but the narrator is hard to listen to and there are very little differences between characters, making it hard to follow. wish there was another narrator option for the earlier Serge books. Perhaps the best and most twisted of the series! A hysterically funny little tale fortified with twisted craziness that exemplifies the trailer park spectacle that is Florida!